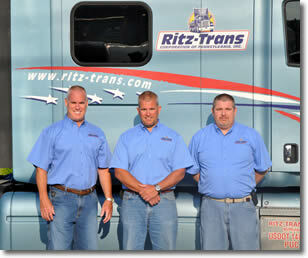 Ritz-Trans is a privately owned and operated company committed to providing unmatched service and dependability to our customers, as well as a safe work environment for our employees. We are a full-service and fully licensed transportation company specializing in modular and manufactured home transportation. Using our own private fleet of vehicles to secure consistent service and flexibility, our experience, energy and enthusiasm will get your home where it needs to be in a timely and reliable fashion. On average, Ritz-Trans dispatchers and drivers have more than 20 years of experience, and our in-house mechanics have more than 25 years of experience. Regular inspections and maintenance on our fleet of 13 company-owned and operated trucks ensures quality handling and on-time delivery. No matter the load, our dependability and superior customer service will keep you happy and assured.